Bears Star In British Honey Commercial [VIDEO] - Joe.My.God. Once upon a time, there were three bears who lived in a house deep in the sun-dappled woods. We’re talking about Matt, Joel and Phil. 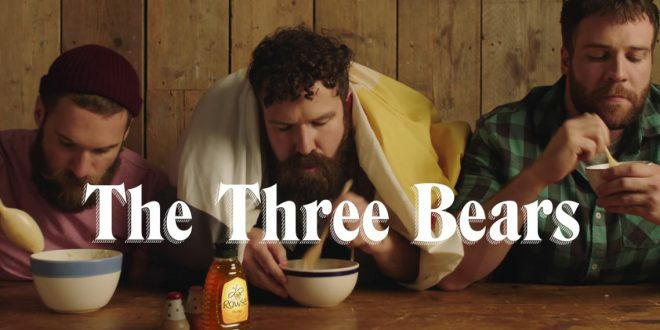 You’ll notice pretty much immediately that they’re not axially bears—well, not in the ursine sense They’re burly, hirsute gay men—slang term: bears—starring in agency BMB’s cheekily unconventional content play for Britain’s Rowse Honey. In the most famous version of the classic fairytale, a wee lass named Goldilocks wanders into the home of a papa, mama and baby bear, sampling each one’s bowl of porridge to see which suits her taste. BMB’s reimagines the story as a short-form online cooking show, and Goldilocks is nowhere in sight. Only papa bears live in this particular cottage. But piping-hot porridge—topped with Rowse Honey, of course—still has a role to play. Hit the link for more about how the campaign came to be and how the three bears were chosen.